I don't eat sandwiches as often as I used to... like, hardly ever these days... but I sure do love them and sometimes it's the only thing! 1. Philly Cream Cheese & Welch's Grape Jelly. On Wonder Bread, of course! 2. Butter & Honey. Mom would make these sandwiches in the morning and pack it in our school lunches. By lunchtime, the honey would have begun to crystallize along the cut edges. Oh, that was the best thing. 3. Peanut Butter & Banana. I also have fond memories of Peanut Butter & Marshmallow Creme, but am very content to leave that there in the memory department. I have, however, continued the pleasure of PB & Banana to the present day (though quite sparingly). 4. Grilled Cheese. White bread with butter, processed American cheese, grilled just so... oh yum! We didn't eat out often when I was a kid, but when we did I always ordered a grilled cheese sandwich (really hard to screw up)... until I discovered fried shrimp! 5. Ham & Swiss. This is my go-to at any sandwich shop... anywhere, anytime, on anything, with a little mayo and yellow mustard. Perhaps with pickles. I love it on all kinds of bread or as a wrap, but probably my favorite medium for consumption is a toasted bagel (plain, egg, everything). 6. Roast Beef & Provolone... warm, with mushrooms. Otherwise known as #15 at the Deli Sub Pub, favorite lunch stop of my early working days. Man, I loved that sandwich. 7. Fish Sandwich. I love fish and I love sandwiches. I haven't eaten at McDonald's in years*, but when I was a more regular customer I always ordered a fish filet. 8. Turkey & Cream Cheese with Cherry Chutney. On toasted granola bread. Served with dill potato salad and chunky applesauce. It's my favorite sandwich at The Cookery in Door County. I sometimes wish I could broaden my horizons. 9. A Classic Club Sandwich. This was a favorite from my even earlier working days -- my first job on my own in Superior, WI. I can't remember the name of the diner I'd go to, but they made a great club sandwich! 10. Reuben. Mmm, a good and very dark rye bread, just the right amount of corned beef, the tang & texture of (well-drained) sauerkraut, and the sweetness of Russian dressing. Bonus: 11. Gyros. Also a favorite of the working girl... there was a fantastic Greek restaurant called Karras' that we went to often; oh man, the best Greek food around. *Actually, in desperation, we had McD's at O'Hare on the way back from Mexico; of course, I had a fish filet... and I wish I'd been more disappointed! It certainly wasn't stellar, and I won't be a regular consumer ever again, but it would probably number amongst my guilty pleasures if I ever had to make a list of such things. We've been in a bit of a rut and I've packed on a few pounds... opting for what's easy over what's better will do that. I took back the kitchen over the weekend, and it felt great!! I'll probably make a Wedge Salad tonight, too, because the thought popped into my head the other day and it's stuck. Work continues on Devan, Junebug's new spring sweater. I made the fix to shoulder/neck shaping, so both fronts are finished, and I knocked off a sleeve over the weekend. The second sleeve was cast on last night, and I discovered that I mis-wound the second ball of self-striping yarn so had to stop and rewind. I should be all set now! I'm beginning to think about a slight variation to the back design! I also spent some time contemplating color choices for a new shawl. Romi's Mystery Shawl 2015 begins on Friday, and there are two colors. Pictures always seem to help. This is a combo that I dyed, and #1 contender for the project. Until this came along. On the left is Sophie's Toe's "Indigo" and on the right, a sherbet-y, salmon-y orange that I recently dyed. It may be reminiscent of school colors to some, but not to me! Then I paired the indigo with the lighter blue from the first set and I like that, too. I think it's going to be the middle one, but I have until Thursday night's wind-up to make a final decision! For the past couple of weeks, I've been accompanying a friend to open houses and real estate showings. She lives in an adorable, historic, little house across from a beautiful park, but she has two young boys (5 & 6) and "little" is not working anymore! Wow. What an education! Other than the whirlwind house-buying-by-committee expedition that I was on last spring with Rusty, Ali & Annie, it's been a long time since I was house-shopping. My friend, also named Ann, has been looking at homes within a certain school district and price range -- everything from new construction to historic, and a much larger pool to choose from that we had last spring. One day last week, we were at a house just a few doors down from the first house that my parents ever bought! It was a brand new subdivision, then, and I lived there from 3rd to 7th grade, so a lot of growing up. It was so much fun to be in the old 'hood. I think we dashed around to at least a half-dozen open houses yesterday and I still had that critical eye when I walked through my own back door! "This house has a really nice kitchen," I thought! I'm also very much inspired to get back on the KonMari horse... and maybe to paint my kitchen! Or something! Clean & fresh!! Can you believe we're looking at the last day of March tomorrow?! Ali sent me this delightful series last night. That's in the corner of KC&T that houses my hobby shop... and I know he's not the first little kiddo to fondle and rearrange the yarn!! A lot has changed in Wisconsin. The state used to be dotted with tiny independent cheese factories -- and I mean they were everywhere! That's sadly not the case anymore. I miss them! 1. Squeaky cheese curds. You can find fresh cheese curds at some farmer markets, every grocery, and even at gas/convenience stores. 3. Kraft American cheese, but never individually-wrapped singles. I like peeling the layers on a sliced block. I love a good ol' fashioned grilled cheese sandwich -- with tomato soup, of course! This was also the cheese on the bologna sandwiches of yesteryear, as well as many a dinner when paired with saltine crackers! The kids always loved my sister Karen's American Cheese Soup. 5. Colby cheese. A very smooth and mild cheese, similar in flavor to cheddar but perhaps a bit softer. A favorite variation is Co-Jack -- a swirled combo of Colby and Monterey Jack. 6. Mozzarella! In all shapes and sizes. I can adapt. It's the reason I grow tomatoes and basil! 7. Brie & Camembert. Thanks to Mom! A favorite lately is a bit of cherry preserves atop a smudge of brie on a thin cracker. Mmmm. 8. Bleu. Yum... I'm sort of craving a good Wedge Salad right now. 9. Swiss & Provolone. Different cheeses, but sandwich favorites for numbers 4 & 5 on my list: Ham & Swiss and Roast Beef & Provolone. 10. Limburger. (On occasion.) Thanks to Grandpa Blum! Grated Parmesan finishes Cream of Spinach Soup. I could go on and on. Cheese! I knit that wonderful sweater in April -- and here's Mack wearing it in May -- of 2007! It's a wonderful pattern that I've always meant to knit again. But when the longevity is this good -- 8 YEARS -- WHY?? Addy wore it, too, and it still looks fantastic. Too bad that wonderful yarn was discontinued. It's the First Day of Spring!! And my 11th Blogiversary! I had a little time to kill before meeting everyone for Joe's birthday dinner, so popped over to my bike shop to take advantage of The Great Rack Upgrade. The offer (thru 3/31) is to trade in your old bike rack (any make/model) and get 20% off a new Saris rack. I've had a 3-bike Saris rack and it's been mostly okay, but we've occasionally had issues with fitting our different bike styles -- jostling handlebars, mostly. The new one has an arc design and I'm hoping it'll be a bit easier. Maddy was the first to arrive and I thought to take a selfie with her -- I have a few of us but they're not that great. Some people tried to photo-bomb us but, you know, selfie... we saw them coming! Auspicious? Suspicious? I'd originally made reservations for 17, but after some last-minute cancellations, we ended up with 13 on the 13th! We had a great time, though no one had a match or lighter so Joe had to pretend to blow out the candle on his little cake. Haha. Saturday was Pi Day and luckily we had some pie handy! We started our day with pie for breakfast dessert. Annie and the boys came over for a while, and so did Junah! He's holding one of those little shapes from the puzzle up to his ear and "talking." The boys thought it was hilarious! They love him so much and think he's cool... I just love that. The weather was mild, so the boys were in and out, and they also kept tabs on some college basketball games, especially the Wisconsin-Purdue game. Annie and I got the fixings for Traditional Boiled Dinner on Saturday. My dutch oven wasn't big enough to accommodate the corned beef and the veggies, so I did the veggies in a different pot. The only pot that would be big enough is dedicated to dyeing! And I got that dye pot out on Sunday for some coloring up -- and re-coloring -- of yarn! I am so pleased with the over-dye job for Sophie's Rose... the original color was great, but it needed just a little muddying; I've had more than a couple false starts, but I think that project is finally going to sing! The other colors were a range of blues, and then somehow a couple of corals! I knew that the Badgers had a big game on Sunday afternoon, so tuned it at about half-time... the score was very close. At one point -- when Bucky was down 11 points (only the second time all season there was a deficit that big) -- I thought I'd jinxed it all but thankfully they brought it back to tie! And then they won in overtime -- the Big 10 Championship! So now, of course, I have March Madness fever and have even made my bracket picks. Anyone interested in a knitters' tourney? Thanks for all the great feedback about the new blog design! I'm pleased that the cleaner look makes it easier to read. (Still tweaking: I've made the post type a little larger.) I love that some mentioned the inclusion of my old banner into the new! For a while, I changed my banner monthly, but once Parcheesi landed up there, I just couldn't bear to change it; that was some epic get-me-through knitting, and it's one of my favorite and most-used pieces. Have I mentioned that our taxes are done? Earliest finish ever. I am so relieved... and happy that I won't live the next month in constant dread of that chore. There are a few other "chores" hanging over my head, but they're more enjoyable and I'm making some progress. Oh, it's a glorious day and the weekend is upon us! That's the same -- much smaller -- snow pile as yesterday; the sandals are my Fluevies! Ali & Junah joined me for a drive over to have lunch with Maddy on Wednesday, but not before I was able to get some yarn prepped for dyeing. I have yarn to dye for Romi's Mystery Shawl, for Sophie's Rose, and for an upcoming sweater for Junah that I'm very excited about -- one that's been on my radar for a LONG time. After that stretch of nothing-but-baby knitting at the end of 2013, I've barely knit a stitch for him. I might not get to all of that over the weekend... Romi & Sophie are the current priorities! This weekend will see a birthday celebration, Pi Day, possibly a high school basketball game, a bike ride (or two), and a pretty darn nice weekend. I've changed the blog design!! After playing around with different/responsive designs on "test blogs" for quite some time, I thought I'd try out Typepad's new "Nimble" design. It's supposed to be easier to read/navigate on all devices. I can always go back! Don't forget about Craftsy's BIG Sale -- all online classes up to 50% off in celebration of National Craft Month. Sale ends Monday! It occurs to me that my recent increased interest in fashion & style is as much a result of sewing some clothes as anything else. The hand-sewn Alabama Chanin-style shirts I made last year -- whether using a paper pattern or an existing shirt as a pattern -- made me much more aware of how it all works. Shape, cut, the mechanics of sewing, and pattern making. It's also about projects in the wings. I have the goods for a couple of dresses that I'd like to make but, you know, that is some serious commitment. If I'm going to stencil, cut, and hand sew an entire dress... well, I'd sure like to know that there's some hope of it fitting and of it looking relatively good on me! And CURIOUS! 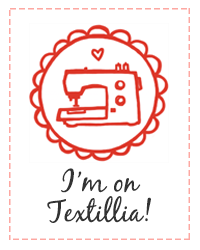 I became so curious about the mechanics of it all that I added some sewing classes to my Craftsy library. I haven't actually made one, but I was completely enthralled and fascinated by the idea of slopers, and I learned so much about how and why things fit. And, really, IT'S ALL ABOUT FIT! Even if you're all about nothing but jeans and t-shirts, at least they should fit... it makes such a HUGE DIFFERENCE, no matter your size or shape. That's what Amy Herzog's books Knit to Flatter and Knit Wear Love , and CustomFit are all about in the knit world. Knitter, know thyself. Take measurements!! And here's me high-stylin' today. There's still snow on the ground and I'm wearing a winter coat (unbuttoned), but I just COULD.NOT wear shoes today. I will be lucky to get another full season out of these well-worn and beloved Wolkys. If you're interested in checking out some classes, too, Craftsy is offering a BIG sale with all online classes up to 50% off so that you can spend National Craft Month (and beyond) doing more of what you love. Sale ends Monday! In addition to the "extra hour" of daylight, the days here are getting longer at the current rate of over 3 minutes per day! With the manipulation of the clock, that extra hour is just shifted from the beginning of the day to the end... I was driving both to & from work in daylight last week, but it's dark again in the morning. 1. Last night we took a walk before dinner. 2. We went before dinner because we thought it would be too late afterwards, but we enjoyed the daylight for quite a while... the sun set at nearly 7:00. 3. We're all still adjusting. 4. With all that extra daylight, I was able to see buds on the trees. 5. I'm looking forward to getting things done! I'm just naturally more active during daylight hours. 6. That will include some after-work bike rides beginning soon. 7.a. Indigo dyeing -- both fabric and yarn. 8. The snow is melting fast, and we didn't have that much to begin with... and I know it's too early, but I couldn't help it but glance to the spot where I'll eventually watch my hostas begin to appear. 9. I can't recall doing a single garden-related thing last year, except perhaps a very late pruning of my espalier tree... because espalier. So, as soon as I'm able, I'm actually looking forward to doing some yard work! The forecast is for 60F today... I feel as though we're over the hump!